Connecting the Disney World resort area with nearby Kissimmee and Buena Ventura, Osceola Parkway travels partly as a controlled access toll road and as a surface arterial across northern Osceola County and southern Orange County. The toll section runs between Seralago Boulevard, east of the exchange with Florida 417 (Central Florida GreeneWay), and Flora Boulevard, north of Kissimmee. The arterial portion extends east through north Kissimmee and the Buena Ventura community to Simpson Road (formerly Boggy Creek Road). South of the Orange County line, Osceola Parkway was funded by Osceola County. The county-maintained facility is designated County Road 522. A $335 million Reedy Creek Improvement District construction package approved on June 22, 2016 includes upgrading the at-grade intersection along Osceola Parkway at Victory Drive into a grade separated interchange. Work runs through the end of 2018. Also approved on June 22, 2016 was a $12.3 million contract to replace the signalized left turn from Osceola Parkway east to World Drive north with a new loop ramp.1 Opened on March 20, 2017, the ramp completed the cloverleaf interchange joining the two limited access roads. A Project Development & Environment (PD&E) study is currently underway to extend Osceola Parkway further east to the proposed Northeast Connector Expressway. 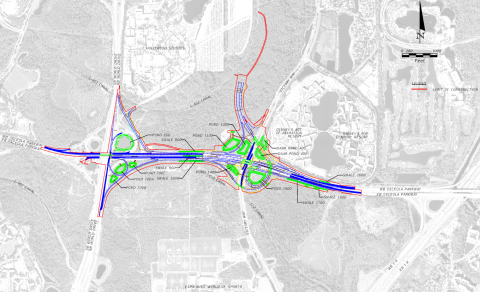 Part of the study includes a connection between Osceola Parkway and Florida 417 near Boggy Creek Road (Exit 17). Michigan Avenue, unmarked CR 531, northbound at Osceola Parkway. Michigan Avenue ends across from the entrance to Gateway Station Shopping Center. Photo taken 08/25/07. A large signalized intersection joins Michigan Avenue with the six-lane Osceola Parkway. Street signs for Osceola Parkway include the sun trailblazer for the toll road. Photo taken 08/25/07. Poinciana Boulevard links SR 535 (Vineland Road) with Osceola Parkway west. Photo taken 04/26/14. International Drive north connects with Osceola Parkway (CR 522) midway between its interchanges with Interstate 4 and SR 417 (Central Florida GreeneWay). Photo taken 11/03/18.